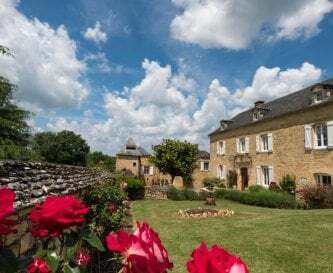 Les Charmes de Carlucet, Sarlat, Dordogne, France, sleeps 7-21 in 9 bedrooms. 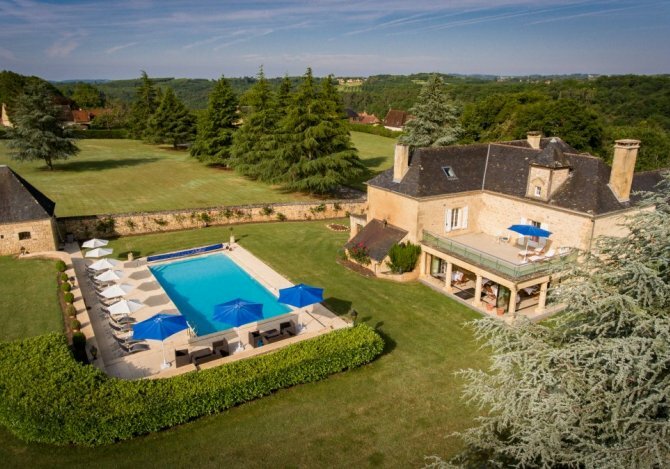 In the heart of Périgord Noir in the “Golden Triangle" of the Dordogne valley between Sarlat (12km) and the caves of Lascaux (15km) is this magnificent 5 star rated, C18th 6 bedroom manor house. With a large heated outdoor pool and sauna, 6 double bedrooms, all with en suites and air con, 70m2 living room with large fireplace with wood burner, professional kitchen, separate dining room, the Manor house can comfortably sleep up to 14. Next door is the luxury 3 bedroom cottage Beaux Reves, also rated 5 stars. Private pool, all bedrooms have air con and en suites, large living dining room and wood burner. Comfortably sleeps up to 7. 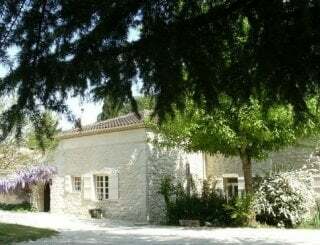 Both properties are set in 20,000m2 of beautiful secluded gardens. Our guests love the beautiful secluded setting of our large heated outdoor pool and sauna. 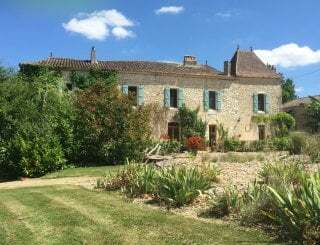 Les Charmes overlooks the beautiful historic hamlet of Carlucet with its stunning 11th century church and is 2 km from the pretty village of Salignac-Eyvigues which has a lively market square, grocery shops and good restaurants. 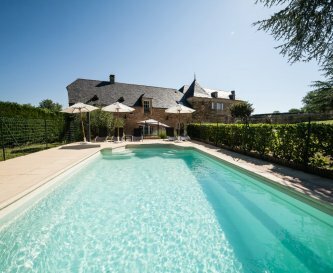 You will find peace, tranquility and comfort as you enjoy a break in one of the most beautiful and interesting parts of France. 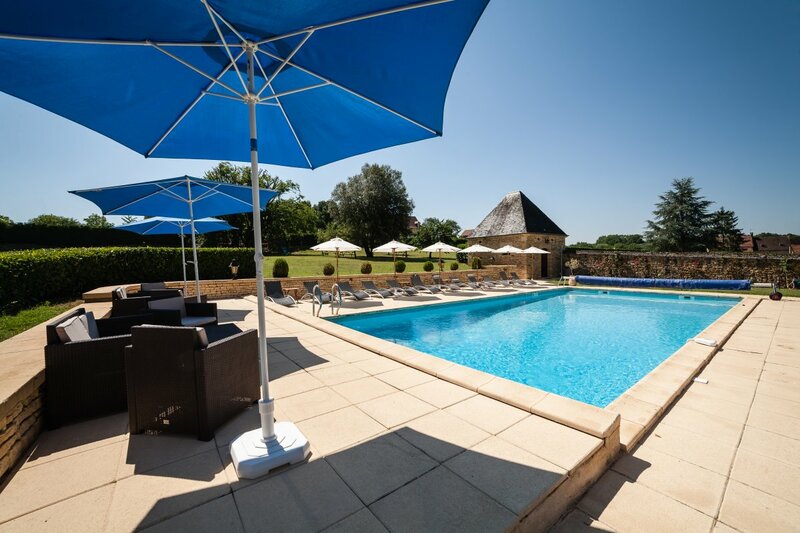 Our guests love Les Charmes de Carlucet because of its glorious setting and its perfect location to explore the best sites and attractions this beautiful area of Perigord Noir has to offer. These include the beautiful Dordogne and Vezere valley, canoeing, prehistoric caves, stunning chateaux, village markets, the beautiful medieval towns of Sarlat, Beynac, La Roque Gageac and the pretty village of Domme perched above the Dordogne valley offering spectacular panoramic views of the valley and surrounding countryside. Also only a short 40 minute drive to the stunning cliff top town of Rocamadour, the second most important site in France, after Mont Saint Michel. We are also situated with direct access to some of the most spectacular cycling routes within the Dordogne region. Just outside our front door you can find a wonderful network of beautiful bike routes suitable for all abilities. We can arrange bike rental for you from Les Charmes. Manor- professional kitchen, dishwasher, gas hob, electric oven, microwave. Beaux Reves- microwave, oven, gas hob, dishwasher. Both fully equipped. Manor- large separate dining room facing the sunny terrace and pool. Seats up to 20 people. Beaux Reves- open plan dining area. Seats up to 7 people. Large (70m2). Seats 14. UK and French satellite channels, fireplace with wood burner. Beaux Reves- large open plan. Wood burner. UK TV. Seats 7. Sky UK TV and French TV in living room and bedroom with terrace in Manor. TV in all bedrooms in Manor. High quality Bosse blue tooth docking station. Free WiFi in all rooms in the Manor house and also in Beaux Reves. Good mobile reception at the property. Manor- central heating in all rooms. Fire place with wood burner in living room. Beaux Reves- electric heating in all rooms, wood burner. Manor- 5 kingsize, 1 with double and 2 single beds. Beaux Reves- 2 kingsize, 1 with double and 1 single. All with en suite bathrooms and air con. Bed linen and towels provided. High quality, soft bed linen using quilts and covers, mattress and pillow protectors. Mattress pads for extra comfort. Manor- 6 en suite bathrooms. 2 have bath and shower. All have shower. Beaux Reves- 3 en suite bathrooms. 1 has bath and shower. All have shower. Cots and bed linen for cots provided free of charge. High chairs, baby baths, stair gates can also be provided free of charge. Both pools have alarms. Both houses have sun loungers, terrace furniture, badminton, table tennis, football. 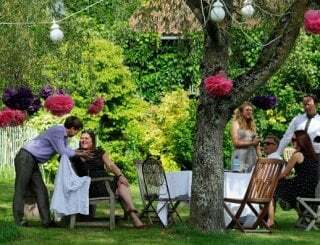 Set in 20,000m2 secluded gardens, BBQ (gas for Manor). Manor- Private heated outdoor 15x7m, shallow & deep end. Pool house, Sauna, toilet, fridge. Beaux Reves- Private outdoor. 8x4m. Both have alarms. 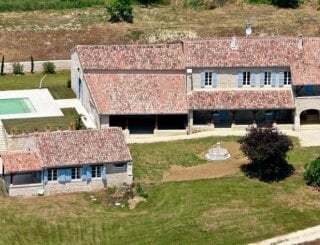 There is ample parking spaces for up to 12 cars in the private grounds of Les Charmes de Carlucet. Smoking is not permitted inside the properties. If you wish to smoke, please can you do so outside in the garden and please use the ashtrays provided. In the beautiful hamlet of Carlucet, 1km from pretty village of Salignac. 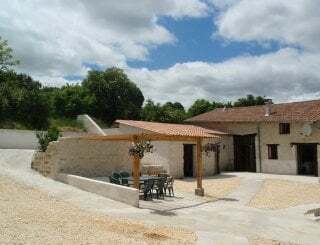 12km from Sarlat, 15km from Lascaux cave. 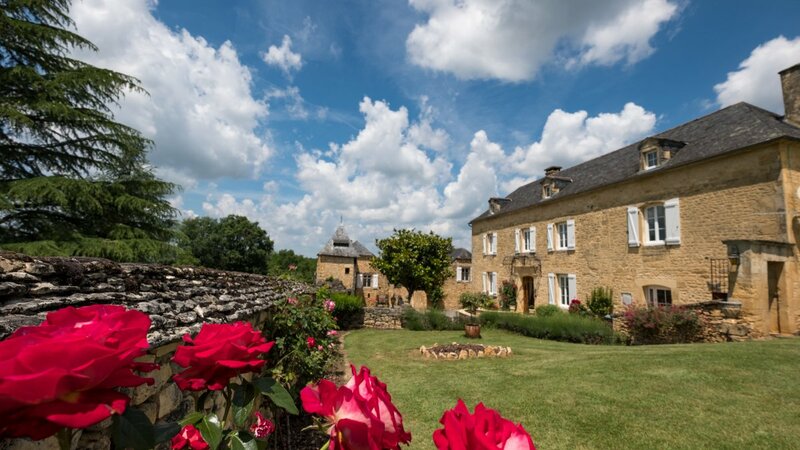 Close to Dordogne valley with canoeing, prehistory, beautiful villages, chateaux. 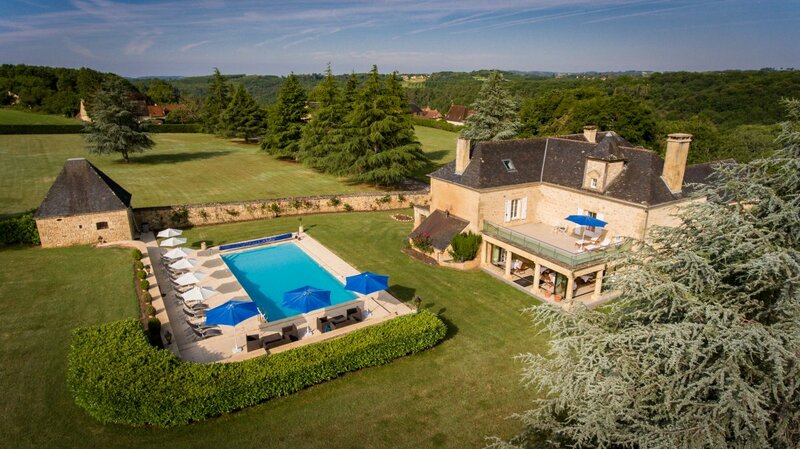 Jewel of the Dordogne, Sarlat la Canéda, is 12km away. World famous caves of Lascaux in Montignac are 15km away. Domme, La Rogue Gageac, Beynac are all within 25 mins drive. Rocadadour 40 mins drive. In the pretty village of Salignac there is a large supermarket Intermarche, also a boulangerie, butchers, local produce store and a weekly market. Sarlat la Canéda has many shops and a weekly market. The very popular Black Duck gastro pub is next door. Just a 5 min walk. French run with fantastic local food. 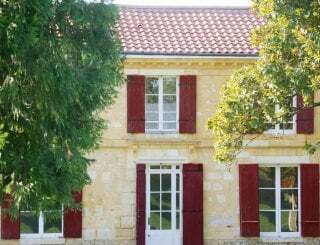 There are good restaurants in Salignac, 1km away and also in the surrounding countryside. Prices in table are in Euros. Rental is on weekly basis during high and mid seasons, changeover day Saturday. Outside these dates min. stay is 3 nights. 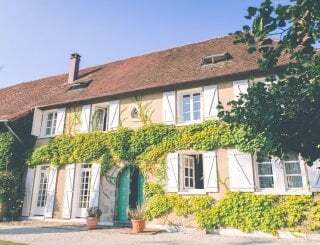 Security deposit is required to cover cost of any damage and will be returned on departure: Manor House is 700 Euros, Beaux Reves is 500 Euros. Sarlat la Canéda station SNCF is 18km, Brive la Gaillarde station is 28km. Brive has fast rail links to Paris. 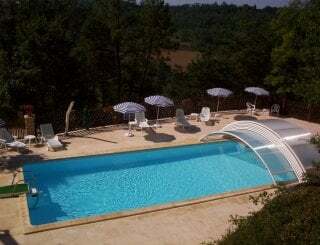 Nearest bus stop is about 4km and has links to Sarlat, Soulliac and Montignac. Brive-Souillac airport 18km, Bergerac airport 63km, Limoges International airport 99km, Toulouse-Blagnac airport 145km, Bordeaux-Merignac airport 155km. Manor house (Sleeps 14) & Villa (Sleeps 7), Both available from 4-9 May & 13-18 May. Min 3 nights. 10% discount. Both houses have heated pools. Both 5 star accommodation. Near Sarlat, Dorodgne.